Way back in the mists of time – okay, make that 2001 – something was stirring that was to forever shift the equilibrium of gaming as we know it. Something that changed the gaming landscape forever. SEGA created a brand new Sonic the Hedgehog game for a Nintendo console. Specifically, that game was Sonic Advance for the Game Boy Advance. Released in 2001/2002, this was Sonic’s first completely unique game for Nintendo after the end of the “console wars” that saw the demise of the Dreamcast and all potentially new SEGA consoles (for fact fans, the first Sonic game full stop on a Nintendo console was Sonic Adventure 2 Battle). The idea of having the infamous blue hog on the same gaming platform as his arch rival plumber was unheard of, and could have been the cause of a lot of problems. Luckily, people were not to worry as Sonic Advance was a solid, if short, game. Advance starts with the same plot as most of the other 2D Sonic games – Dr. Eggman is doing something evil and you need to stop him. But you’re not limited to Sonic and Tails only in this game. Knuckles returns once again, and Amy makes the starting line-up as a playable character in a 2D game for the first time. This makes for an interesting set of characters, each requiring different skills. Sonic blitz through stages at high speed, Tails can fly over large gaps and Knuckles can glide and punch like a pro. Amy’s control scheme is a lot different – she can’t spin attack when jumping, can’t spin dash and only attacks using her hammer. This brings a bit more variety to the game and adds a higher level of difficulty if you’re not used to it. The stages themselves are varied, if not particularly memorable. The traditional Sonic environments return once again – greeny area, secret base and casino realm to name a few. However, with only 6 zones, plus the final boss zone, the number of stages is disappointing if you expected a large game. Still, the acts are varied enough to contain lots of hidden paths and shortcuts, as well as exploring some lovely animation and backgrounds for the GBA. Of course, collecting Chaos Emeralds are the main order of the day in these games, and this is no exception. The stage activation is very simple – no ring total, just find a special spring in a stage and jump on it. This brings you to the Special Stage – an airboarding ride to collect rings as you fall. Much like in Sonic 2, you can lose rings by hitting bombs, and you need a set amount before you can progress to stage 2, and then a new total for actually claiming the Emerald. The controls are a bit loose and can be hard to grab those rings as you fall. This makes these stages more about luck and memorization, especially as each stage can’t be repeated once you fail (unless you die or reset the game). No Sonic game would be complete without the inclusion of mad bosses, and this is no exception. Eggman’s mechas offer some new concepts and some updates of original ideas. Some are fun, others are frustrating, but all offer a good challenge. The highlight has to be the final Zone – a mini-boss rush of nostalgic proportions as you face off against the first bosses from Sonic 1 and 2, with the same music too. Speaking of which, the music in this game is well suited. Although it holds few memorable tunes by themselves, they suit the stages really well. My personal favourite is that of Cosmic Angel Zone, a great little track to match the space-like nature of this world. 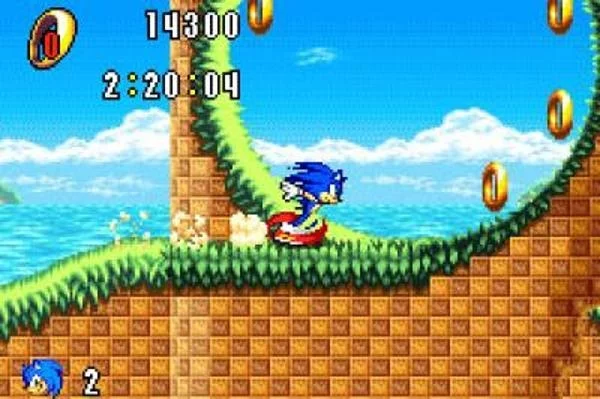 Others aren’t as popular, but some do return time and again such as Neo Green Hill Zone, which was used in Generations as an extra track to unlock. The music might not be perfect like the earlier games – but it’s a lot better than that of other games. A lovely extra in the original release was the Tiny Chao Garden, a mini garden for you to raise your own Chao. Using rings collected in the game, you can buy food, trinkets, eggs and more. You can even transfer your Chao from your GBA to your Gamecube copy of Sonic Adventure 2 Battle (and later, Sonic Adventure DX). This offers more variety and with some sub-games to play there, it added more variety to this game as well as using the woefully underused GC-GBA cable. This game was certainly a success, spawning sequels and even ports to other consoles. But did it warrant that success? Well nowadays, it does seem a bit basic. 12 acts plus 2 final boss acts means it can be completed quickly. However, the time spent playing it is a lot of fun, even if it is over quickly. The Emerald stages are certainly the game’s “brick wall” with replaying them hard to do. But overall, it is a fun little outing and certainly a hidden gem if you’re not played it. GRAPHICS Smooth animation which is bright, cheerful and what you expect in a Sonic game. CONTROLS Some floaty controls on the Special Stages, but overall a tight and responsive game. REPLAY VALUE The game’s over quickly, but 4 characters plus hard Special Stages does make it last longer. OVERALL A great and well deserved introduction to the Sonic series on a Nintendo console.